Since we're into the time of year where most people dig out their classic pearls and wear them, I thought it would be appropriate to remind everyone of some basic pearl care. Pearls should not be kept in 'air-tight' containers,...they need to 'breathe'. To avoid scratching your pearls (and other stones, too), store them in a soft, cloth jewelry bag. To clean your pearls wipe them off gently with a soft, non-chemically treated cloth after each wear and prior to storing them. 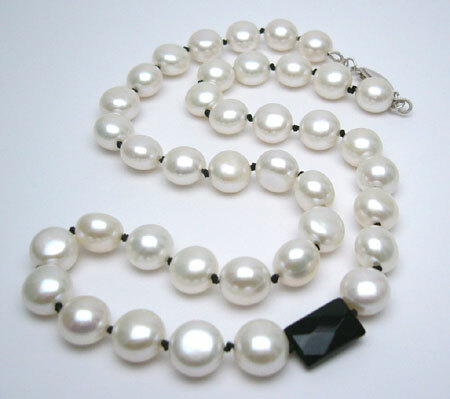 Hand-knotted pearls generally need to be re-strung every 18 months to 3 years, depending on the amount of time you wear your pearls and the conditions/environment in which you subject them to. Keep the silk of your hand-knotted pearls from stretching too quickly by keeping lotions, perfumes, hairsprays, and all other chemicals away from your pearls. This will not only help the silk knots to last longer, but will also help your pearls keep their luster and beauty. Pearls that come in contact with lotions, hairsprays, perfumes and other substances will slowly lose their luster and may become damaged over time, thus losing their beauty and value. When it's time to have your pearls restrung - whether it's newer or older pearl jewelry - please call and ask us for a free estimate! Peace, Love and Beautifully Strung Pearls, Baby!! Thanks for these tips, Shel!